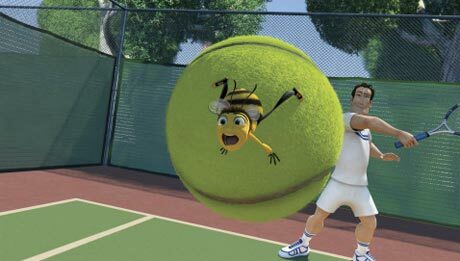 Jerry Seinfeld retains his rep as the smartest comic mind of our time with the brilliant animated tour de force Bee Movie, a sharp film designed as much for adults as kids. Maintaining his penchant for mining comedy gold from the seemingly mundane, Seinfelds first major foray playing someone other than himself is focused on the intricate, obscure world of bees and our oblivious reliance on their honey manufacturing methods, which delicately maintain natures balance. The storyline reflects Seinfelds ongoing fascination with industrious people (or insects) working conventional jobs and, as Barry B. Benson, he plays a young bee dying to avoid regular life at all costs. After graduating from college, Benson is distraught to discover that bees are expected to stay in their hives, working the same honey-making jobs for the rest of their lives. While good friend Adam (Matthew Broderick) touts the status quo, Benson is drawn in by the hulking "pollen jockeys, the fighter pilot-like bees that are launched outside each day to gather nectar and pollinate flowers. Aside from the freedom, Benson is intrigued by human beings, particularly a florist named Vanessa (Renée Zellweger), who saves him from the boot of her overbearing boyfriend Ken (hilariously voiced by Patrick Warburton). When he discovers that people wantonly use honey in various products, Benson investigates bee farms and launches a full-scale court case against a honey manufacturer, leading to an endearingly bizarre range of real-life superstar cameos and a revolution for bees in the workplace.